This enlightening and thought-provoking look at New York City’s postwar art scene focuses on the galleries and the artists that helped transform American art. While the achievements of New York City’s most renowned postwar artists—de Kooning, Pollock, Rothko, Franz Kline— have been studied in depth, a large cadre of lesser-known but influential artists came of age between 1952 and 1965. Also understudied are the early, experimental works by more well- known figures such as Mark di Suvero, Jim Dine, Dan Flavin, and Claes Oldenburg. Focusing on innovative artist-run galleries, this book invites readers to reevaluate the period—uncovering its diversity, creativity, and nuances, and tracing the spaces’ influence during the decades that followed. Inventing Downtown charts the development of artist-run galleries in Lower Manhattan from the early 1950s to the mid-1960s, showing how the area’s multicultural spirit played a major role in shaping the artworks exhibited there. The book explores 14 key spaces in which styles such as Pop, Minimalism, and performance and installation art thrived. Excerpts from 33 revealing interviews with artists, critics, and dealers, conducted by Billy Klu&#776;ver and Julie Martin, offer unique personal insight into the era’s creative milieu. Taken together, the book’s essays and interviews provide a distinctly new assessment of how downtown New York’s fertile environment nurtured an innovative art scene. Melissa Rachleff is Clinical Associate Professor at New York University's Visual Arts Administration masters program. "Have a hefty helping—which means take some time with this show (or, if you can’t make it to the Grey Gallery, the beautiful, readable catalog). It’s worth it." "The final success of this exhibition (and the accompanying catalogue, which is a feat of rigorous scholarship) is to chart this history between Abstract Expressionism and Minimalism and Pop." "Rachleff deserves our thanks for amassing a wide and wild range of material, from art works to documentary photographs to gallery ephemera...Driven by curiosity, this is curatorial practice at its best." Both the book and the densely hung rooms at the Grey, which are full of paintings, sculptures, and drawings by artists who exhibited in these improvised galleries, offer a useful corrective to the oversimplified art-historical narratives on which we all too often rely unthinkingly. " 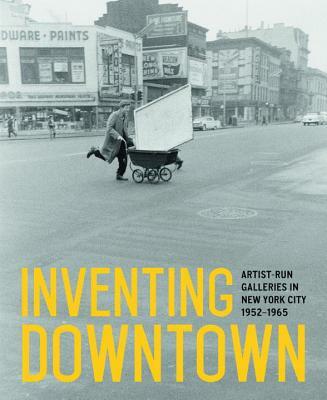 Inventing Downtown, tells the story of that lost chapter, the upstart gallery scene that flourished for more than a decade in the East Village, bequeathing a body of work that considerably scrambles not only the map but also the lock-step narrative of 20th-century art movements."